Hello everyone, and happy summer! My favorite season is officially here and I couldn’t be more thrilled! This is the perfect time for light, fresh meals that can be prepared outside, and that are bursting with life and color. A few weeks ago I gave you my mom’s recipe for a grilled chicken with a latin-loving salad made of beans, plantains, avocado, and jalapeno peppers. That recipe got me inspired to have a grilling session of my own, using another of the World Harbors marinating sauces that my mom raved about. She loved the lemon pepper and garlic one that she put on the chicken, but this time I decided to be adventurous and try the Jamaican-style Jerk sauce, which I must confess, I had never had before. And I also have to confess that I LOVED it! If you’ve never tried Jamaican Jerk Sauce, it has an exotic and punchy mix of flavors (soy sauce, vinegar, chili peppers, and spices) that goes perfect with any kind of meat you decide to use. Since I’m a big fan of fish, but don’t eat it as often as I should, or as often as I would like to (cooking fish in a small apartment in NYC can be a very smelly experience! ), I chose this special occasion to get my protein dose. After all, one doesn’t try a new sauce everyday! 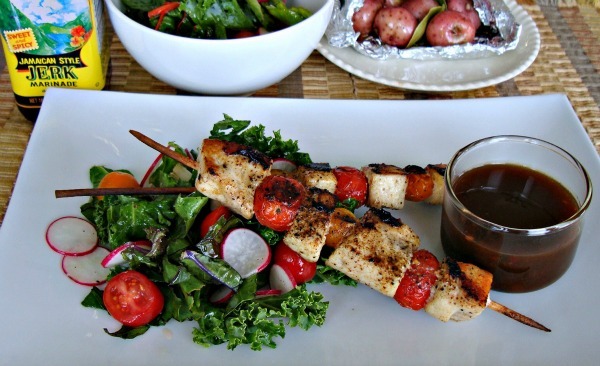 These skewers are the result of this experiment with Jamaican Jerk. I think the pictures show how awesome they were, and not much description is needed. But if you need reassurance: THEY WERE DIVINE. Don’t waste any more time and go try them! If you’re a fish lover you can’t go wrong with these, and thy are the perfect option for a healthier BBQ. Have a great summer full of fresh and delicious food! Preheat the oven to 350F. Or get the grill ready. Put the potatoes in a square of baking foil, sprinkle with salt and pepper, add bay leaves, a couple tablespoons olive oil, close the foil to form an envelope. Bake for 30 – 45 minutes, until the potatoes are tender when pierced with the tip of a knife. 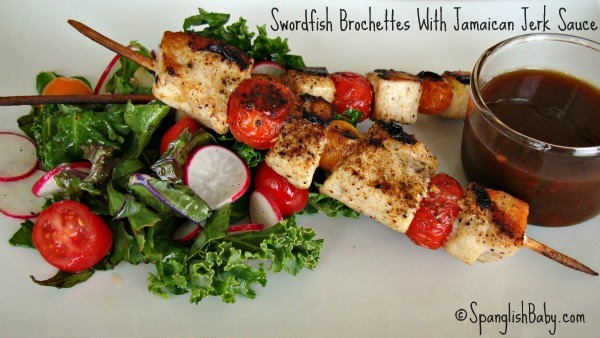 Using wet wooden skewers, thread pieces of swordfish, alternating with grape tomatoes. Add salt, pepper, and olive oil. Now you can grill, bake or fry your brochettes. The fish should be cooked through, juicy, not dry. Meanwhile prepare the salad. 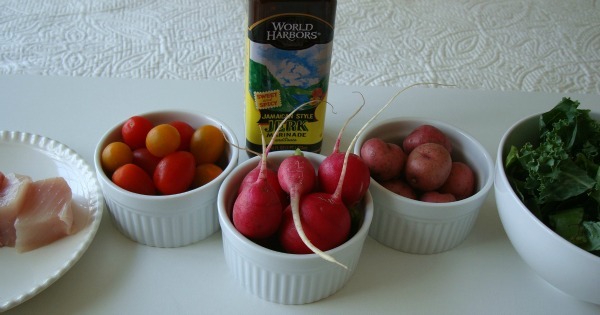 Wash the baby chard, slice the radishes paper thin, combine them in a salad bowl, add salt and pepper, olive oil, and the juice of half a lemon. Mix everything and serve in a plate. 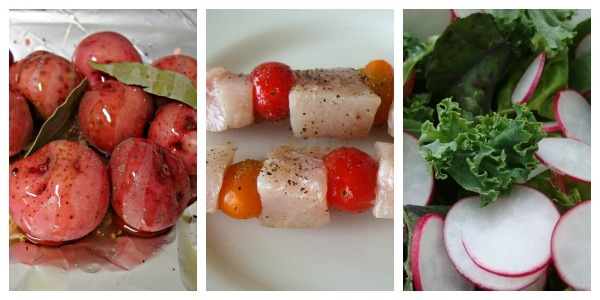 Over the salad arrange two fish brochettes. Serve the potatoes at the side, with more salad. ** Use any fish available. Salmon, halibut, sea bass, etc. You can add scallops. ** Instead of grape tomatoes use bell pepper, onions, mushrooms, etc. enjoying your blog. I too am an aspiring blog blogger but I’m still new to the whole thing. Do you have any tips for first-time blog writers? I’d certainly appreciate it.